The prolific painter draws on intuition and experience to explore what it means to have a body. Cooped up in a trailer at the North Dakota State Fairground, artist Lauren Roche spent three weeks waiting for work. It hadn’t been a good harvest, meaning fewer jobs processing sugar beets than Roche and friend Tynan Kerr had anticipated. Although Roche had been drawing since she could hold a pen, it wasn’t until these three weeks in 2012 that she began to share her work publicly, with the support of fellow artist and close friend Kerr. “I’m sure a lot of people that make art have that weird moment of ‘when do I show people? Or, why?’” explains Roche. “I applied for the Jerome Emerging Artist Fellowship that same year, only a few months later, and got it.” Soon after receiving the grant, she appeared in first a group and then a solo show at Bockley Gallery, who now represents her. Meridian Handler; acrylic, gouache, watercolor, and ink; 2019. One of the most immediately noticeable things about her paintings is the cohesive world she’s built. 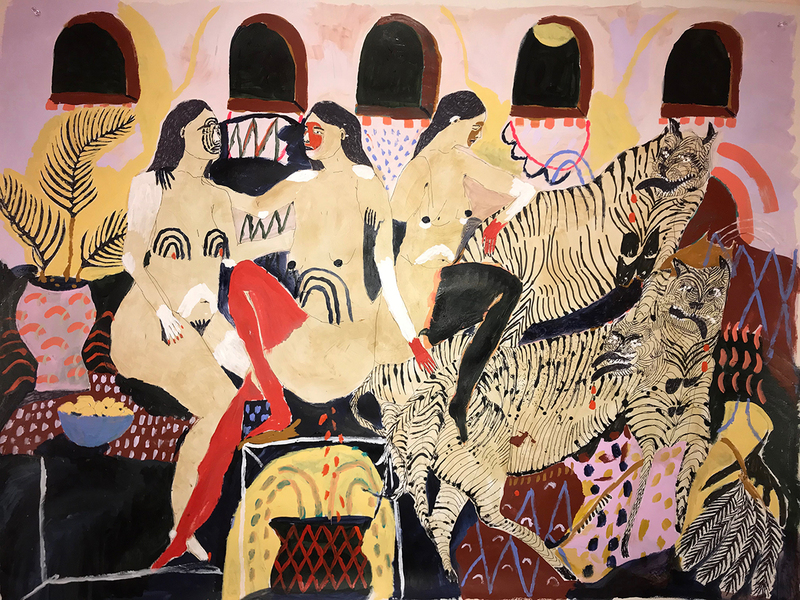 Within vibrantly colored, abstracted and cropped interiors, she places a cast of female figures interacting with themselves, each other, and their environment in a way that feels staged yet ambiguous. The locations and undefined actions mirror Roche’s own confusion and confliction when it comes to her body. As a child, her ability to dissociate from her surroundings served as an effective coping mechanism during periods of physical and emotional abuse. Now, it’s left Roche with a complicated relationship to her physicality, one that comes out in her painting. Quiet Host; acrylic, gouache, watercolor, and ink; 2019. While the presence of women relates to her history of dissociation and body dysmorphic disorder, the many animals in her paintings stem from a negative religious experience in her teens. Processing her phobia through painting, Roche’s animals took on vastly different qualities — not all are demonic; many seem to be giving or supportive. 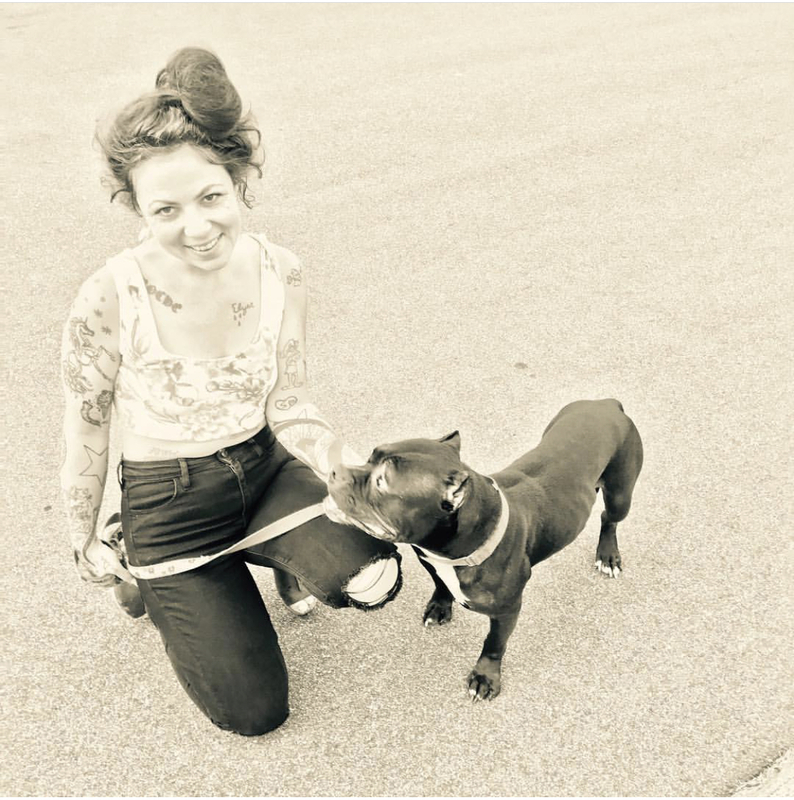 The woman and the “other,” in this case an animal, connect with each other in a world apart. Dissociating from her environment had become less frequent, until she was placed on bed rest almost two months ago following a severe back injury. Now, she is again face-to-face with a debilitating physical situation. Pen & ink drawings made while the artist is on bed rest. Images courtesy of the artist's Instagram. Having recently received the Joan Mitchell Foundation Painters & Sculptors Grant, Roche hopes having more time to work on her art can be the silver lining to her injury. Like many artists, she has had to work a slew of other jobs in order to make a living, often leaving less time than desired for her painting career. 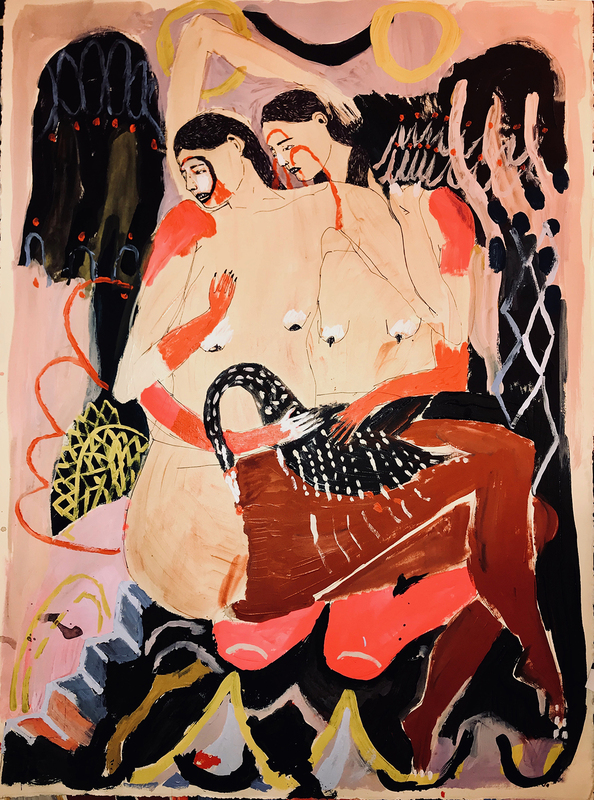 Propped up in bed, letting her connection to and separation from her physical pain express itself through her ritualistic figures, Roche hopes that others will see themselves in her intensely personal work. Lauren Roche is represented by Bockley Gallery. To see more of her work, visit bockleygallery.com. Banner image: Reclining Woman Holding A Vessel; acrylic, gouache, watercolor, and ink; 2019. All images courtesy of the artist.